November 9, 2018 – When the alarm went off, at 5:00am, for a split second I thought it was the smoke detector as the scent of smoke filled the house. 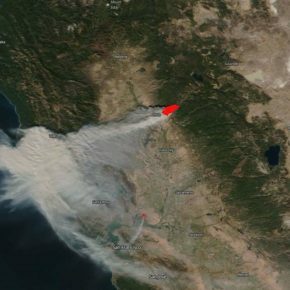 It was from the “Camp” fire that leveled Paradise California yesterday and is turning out to be the most destructive fire in California’s history. 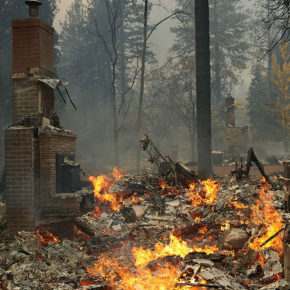 My worries were with my cousin Wayne in Northern Chico. He texted me that north Chico was safe but south Chico was on alert. I wore the Buff most of the day and could feel the smoke in my lungs. The Lake was eerily still –glasslike at times and as the day warmed, the smoke layer dropped onto the lake. It was a reminder that many of my friends were in danger up north and it made the day somber. I use to spend my summers in junior high school in Paradise living with my childhood best friend -Joey Baiocchi ( the brother of Jon Baiocchi the famous Nor Cal Guide) on Salida Way in Paradise. As far as I can tell, it is gone now. As of this blog post, the fire is only 20% contained at 100,000 acres. I arrived at the ramp and there were over 20 boats already launched. Around the launch, I could see lots of 2-3 inch threadfin shad schooling in the shallows. The dam patrol was out in force today and I could see trollers working the racks but no fly guys in close so I went west to fish the shorelines, fishing the “velcro” for stripers feeding on bait in the weeds. I got 4 at Three Trees and headed over to the Bay of Pigs. The height of the lake reminded me of the drought levels a couple years ago, I suppose the DWR is getting ready for a wet year and preparing the lake for some water. There is so much less shoreline structure to fish when the lake is low, my best luck at this water height is long shallow bays like BOP or Lone Oak where fish corner the schools of bait I saw at the Launch. I never got a chance today to work the racks. There were trucks parked there working on the pumps and the patrol was relentless. I fished the Bay of Pigs and metered a big school of nice stripers roaming the bay chasing bait with the 360 sonar. They were moving so quickly that I had to use the motor to catch up with them. Chasing them with the trolling motor was futile. Every time I would get to them, I would get one or two and then have to chase again. Sometimes I would get to the spot only to find scales in the water and no fish. It was frustrating. One school was chomping on a half dead, 6 inch long delta perch. I tried to cast to them, but they weren’t interested in my three inch fly. They never finished eating the poor perch as it swam on its side in a circle. I pulled away from it and watched it for awhile hoping a big one might come back and finish, but no luck. It reminded me of the BIG Giant Trevalley that would eat an entire milkfish that was wounded in the water last week. Next time Im bringing a huge swimbait to throw. For the day, I caught ten fish. All were over 17 inches but only two were over 20. Steph and Eric were out and decided to hang out at the BOP, fish the really shallow water and wait for the school to show. That strategy paid off, they caught lots of good fish and ended with 20 fish for the day. A lone float tuber in BOP must have been going nuts watching the busting school of stripers out of casting range around him every 20 minutes or so. I have been out-fished by float tubers many times on San Luis which has often made me think that chasing fish and searching for moving schools is sometimes not as productive as staying in one spot on the “Striper Highway” and waiting for the action to come to you. That was the case today with Steph\Eric and I. I think they had a better day than I just fishing the BOP for most of the day. There were some big schools of Shad also roaming around the BOP. I cast an indicator with shad flies at them but they weren’t eating. Steph said most of his luck was in less than 12 feet of water all day. It was a good but not great day, It was tough chasing fish today. November 11, 2018 in Fly-Fishing Reports and Subjects, San Luis and Oneill Forebay. Thank you for such an informative and beautiful site! As a brand new local resident (Hollister) i have great interest in this areas striped bass fishery. I’ve been fly fishing for many years but never for stripers before. So far i have spent two separate days on the Forebay with some fairly good luck on smaller fish. I have been fishing out of my personal pontoon boat and really enjoy it. Could you possibly point me in the right direction as to areas i might try on the big lake with the pontoon? i don’t know about accessibility since i haven’t been there yet and would need to be able to park fairly close to the water to launch. Thank you and i hope to see you out there some day! Good to catch up with you and thank you again for the flys. Love them.